Could Cyanobacteria Help to Terraform Mars? Billions of years ago, Earth’s atmosphere was much different than it is today. Whereas our current atmosphere is a delicate balance of nitrogen gas, oxygen and trace gases, the primordial atmosphere was the result of volcanic outgassing – composed primarily of carbon dioxide, methane, ammonia, and other harsh chemicals. In this respect, our planet’s ancient atmosphere has something in common with Mars’ current atmosphere. For this reason, some researchers think that introducing photosynthetic bacteria, which helped covert Earth’s atmosphere to what it is today, could be used to terraform Mars someday. According to a new study by an international team of scientists, it appears that cyanobacteria can conduct photosynthesis in low-light conditions. The results of this study could have drastic implications for Mars, where low-light conditions are common. The study, titled “Photochemistry beyond the red limit in chlorophyll f–containing photosystems“, appeared in the the journal Science. The study was led by Dennis J. Nürnberg of the Department of Life Sciences at Imperial College, London, and included members from the Research School of Chemistry, ANU, the Consiglio Nazionale delle Ricerche, Queen Mary University of London, and the Institut de Biologie Intégrative de la Cellule. Cyanobacteria are some of the most ancient organisms on Earth, with fossil evidence indicating that they existed as early as the Archean Era (c.a 3.5 billion years ago). During this time, they played a vital role in converting the abundant CO² in the atmosphere into oxygen gas, which eventually gave rise to ozone (O³) that helped protect the planet from harmful solar radiation. The photochemistry used by these microbes is similar to what plants and trees – which subsequently evolved – rely on today. The process comes down to red light, which plants absorb, while reflecting green lights thanks to their chlorophyll content. The darker the environment, the less energy plants are able to adsorb, and thus convert into chemical energy. For the sake of their study, the team led by Nürnberg sought to investigate just how dark an environment can become before photosynthesis becomes impossible. Using a species of bacteria known as Chroococcidiopsis thermalis (C. thermalis), they exposed samples of cyanobacteria to low light to find out what the lowest wavelengths that they could absorb were. Previous research has suggested that the lower limit for photochemistry to occur was a light wavelength of 700 nanometers – known as the “red limit”. However, the team found that C. thermalis continued to conduct photosynthesis at wavelengths of up to 750 nanometers. The key, according to the team, lies in the presence of previously undetected long-wavelength chlorophylls, which the researchers traced back to the C. thermalis genome. The researchers traced the origin of these chlorophylls to the C. thermalis genome, which they located in a specific gene cluster that is common in many species of cyanobacteria. This suggests that the ability to surpass the red limit is actually quite common, which has numerous implications. For one, the findings indicate that the limits of photosynthesis are greater than previously thought. On the other hand, these findings indicate that certain organisms can function using less fuel, which the researchers refer to as an “unprecedented low-energy photosystem”. To Krausz and his colleagues, this photosystem could be the first wave in an effort to terraform Mars. Along with efforts to thicken the atmosphere and warm the environment, the introduction of C. thermalis and terrestrial plants could slowly make Mars suitable for human habitation. In this respect, Krausz and his colleagues are joined by groups like the CyanoKnights – a team of students and volunteer scientists from the University of Applied Science and the Technical University in Darmstadt, Germany. Much like Krausz’s team, the CyanoKnights that want to seed Mars with cyanobacteria in order to trigger an ecological transformation, thus paving the way for colonization. This idea was submitted as part of the Mars One University Competition, which took place in the summer of 2014. What’s more, there have been recent research findings that indicate that organisms similar to cyanobacteria may already exist on other planets. If this most recent study is correct, it means that such organisms could survive in low-light conditions, which means astronomers could expand their search for potential life to other locations in the Universe. From offering humans the means to conduct terraforming under more restrictive conditions to assisting in the search for extra-terrestrial life, this research could have some drastic implications for our understanding of life in the Universe, and how to expand our place in it. 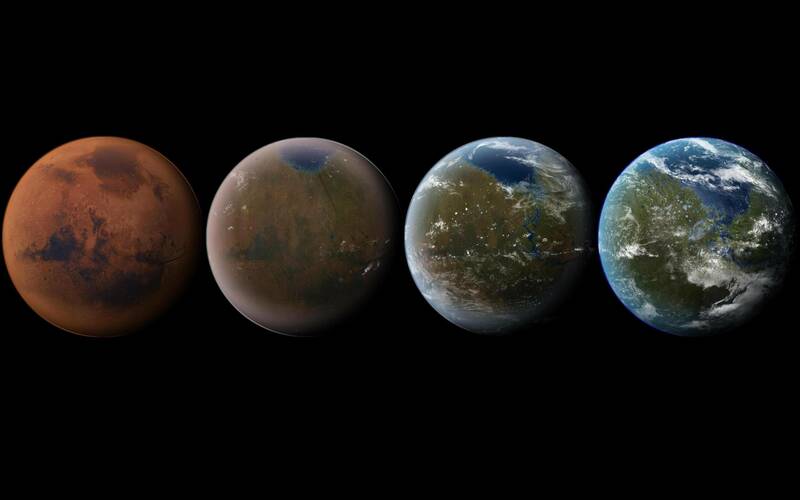 The idea of terraforming Mars – aka “Earth’s Twin” – is a fascinating idea. Between melting the polar ice caps, slowly creating an atmosphere, and then engineering the environment to have foliage, rivers, and standing bodies of water, there’s enough there to inspire just about anyone! But just how long would such an endeavor take, what would it cost us, and is it really an effective use of our time and energy? Such were the questions dealt with by two papers presented at NASA’s “Planetary Science Vision 2050 Workshop” last week (Mon. Feb. 27th – Wed. Mar. 1st). The first, titled “The Terraforming Timeline“, presents an abstract plan for turning the Red Planet into something green and habitable. 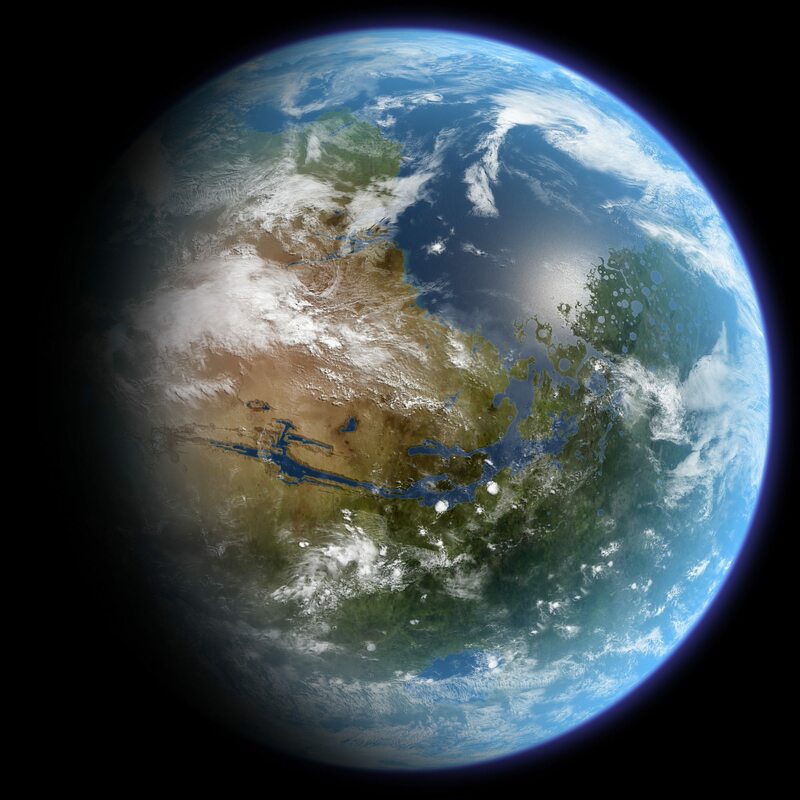 The second, titled “Mars Terraforming – the Wrong Way“, rejects the idea of terraforming altogether and presents an alternative. The former paper was produced by Aaron Berliner from the University of California, Berkeley, and Chris McKay from the Space Sciences Division at NASA Ames Research Center. In their paper, the two researchers present a timeline for the terraforming of Mars that includes a Warming Phase and an Oxygenation Phase, as well as all the necessary steps that would precede and follow. Before these can begin, Berliner and McKay acknowledge that certain “pre-terraforming” steps need to be taken. These include investigating Mars’ environment to determine the levels of water on the surface, the level of carbon dioxide in the atmosphere and in ice form in the polar regions, and the amount of nitrates in Martian soil. As they explain, all of these are key to the practicality of making a biosphere on Mars. So far, the available evidence points towards all three elements existing in abundance on Mars. While most of Mars water is currently in the form of ice in the polar regions and polar caps, there is enough there to support a water cycle – complete with clouds, rain, rivers and lakes. Meanwhile, some estimates claim that there is enough CO² in ice form in the polar regions to create an atmosphere equal to the sea level pressure on Earth. Nitrogen is also a fundamental requirement for life and necessary constituent of a breathable atmosphere, and recent data by the Curiosity Rover indicate that nitrates account for ~0.03% by mass of the soil on Mars, which is encouraging for terraforming. On top of that, scientists will need to tackle certain ethical questions related to how terraforming could impact Mars. To break Phase One – “The Warming Phase” – down succinctly, the authors address an issue familiar to us today. Essentially, we are altering our own climate here on Earth by introducing CO² and “super greenhouse gases” to the atmosphere, which is increasing Earth’s average temperature at a rate of many degrees centigrade per century. And whereas this has been unintentional on Earth, on Mars it could be re-purposed to deliberately warm the environment. Once this thick atmosphere has been created, the next step involves converting it into something breathable for humans – where O² levels would be the equivalent of about 13% of sea level air pressure here on Earth and CO² levels would be less than 1%. This phase, known as the “Oxygenation Phase”, would take considerably longer. Once again, they turn towards a terrestrial example to show how such a process could work. However, they make allowances for synthetic biology and other biotechnologies, which they claim could increase the efficiency and reduce the timescale to a solid 100,000 years. In addition, if human beings could utilize natural photosynthesis (which has a comparatively high efficiency of 5%) over the entire planet – i.e. planting foliage all over Mars – then the timescale could be reduced to even a few centuries. Finally, they outline the steps that need to be taken to get the ball rolling. These steps include adapting current and future robotic missions to assess Martian resources, mathematical and computer models that could examine the processes involved, an initiative to create synthetic organisms for Mars, a means to test terraforming techniques in a limited environment, and a planetary agreement that would establish restrictions and protections. Quoting Kim Stanley Robinson, author of the Red Mars Trilogy, (the seminal work of science fiction about terraforming Mars) they issue a call to action. Addressing how long the process of terraforming Mars will take, they assert that we “might as well start now”. To this, Valeriy Yakovlev – an astrophysicist and hydrogeologist from Laboratory of Water Quality in Kharkov, Ukraine – offers a dissenting view. In his paper, “Mars Terraforming – the Wrong Way“, he makes the case for the creation of space biospheres in Low Earth Orbit that would rely on artificial gravity (like an O’Neill Cylinder) to allow humans to grow accustomed to life in space. Looking to one of the biggest challenges of space colonization, Yakovlev points to how life on bodies like the Moon or Mars could be dangerous for human settlers. In addition to being vulnerable to solar and cosmic radiation, colonists would have to deal with substantially lower gravity. In the case of the Moon, this would be roughly 0.165 times that which humans experience here on Earth (aka. 1 g), whereas on Mars it would be roughly 0.376 times. In addition, he points to the challenges of creating the ideal environment for individuals living in space. Beyond simply creating better vehicles and developing the means to procure the necessary resources, there is also the need to create the ideal space environment for families. Essentially, this requires the development of housing that is optimal in terms of size, stability, and comfort. In light of this, Yakolev presents what he considers to be the most likely prospects for humanity’s exit to space between now and 2030. This will include the creation of the first space biospheres with artificial gravity, which will lead to key developments in terms of materials technology, life support-systems, and the robotic systems and infrastructure needed to install and service habitats in Low Earth Orbit (LEO). These habitats could be serviced thanks to the creation of robotic spacecraft that could harvest resources from nearby bodies – such as the Moon and Near-Earth Objects (NEOs). This concept would not only remove the need for planetary protections – i.e. 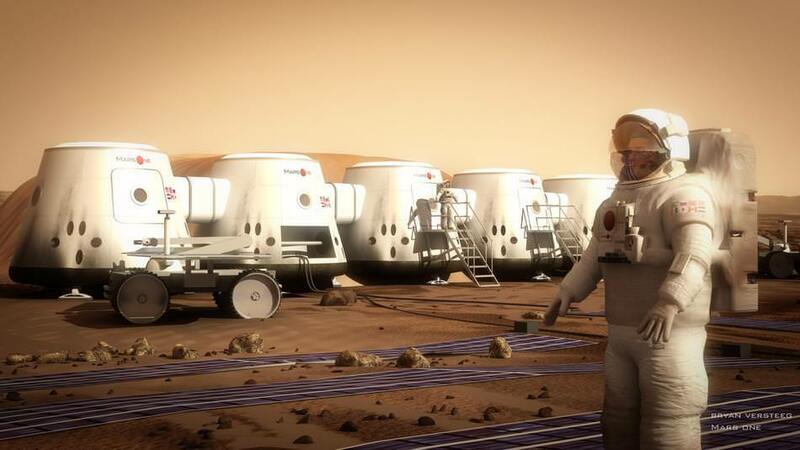 worries about contaminating Mars’ biosphere (assuming the presence of bacterial life), it would also allow human beings to become accustomed to space more gradually. “1. This is a universal way of mastering the infinite spaces of the Cosmos, both in the Solar System and outside it. We do not need surfaces for installing houses, but resources that robots will deliver from planets and satellites. 2. The possibility of creating a habitat as close as possible to the earth’s cradle allows one to escape from the inevitable physical degradation under a different gravity. It is easier to create a protective magnetic field. And with space habitats in place, some very crucial research could begin, including medical and biologic research which would involve the first children born in space. It would also facilitate the development of reliable space shuttles and resource extraction technologies, which will come in handy for the settlement of other bodies – like the Moon, Mars, and even exoplanets. Ultimately, Yakolev thinks that space biospheres could also be accomplished within a reasonable timeframe – i.e. between 2030 and 2050 – which is simply not possible with terraforming. Citing the growing presence and power of the commercial space sector, Yakolev also believed a lot of the infrastructure that is necessary is already in place (or under development). With NASA scientists and entrepreneurs like Elon Musk and Bas Landorp looking to colonize Mars in the near future, and other commercial aerospace companies developing LEO, the size and shape of humanity’s future in space is difficult to predict. Perhaps we will jointly decide on a path that takes us to the Moon, Mars, and beyond. Perhaps we will see our best efforts directed into near-Earth space. Or perhaps we will see ourselves going off in multiple directions at once. Whereas some groups will advocate creating space habitats in LEO (and later, elsewhere in the Solar System) that rely on artificial gravity and robotic spaceships mining asteroids for materials, others will focus on establishing outposts on planetary bodies, with the goal of turning them into “new Earths”. Between them, we can expect that humans will begin developing a degree of “space expertise” in this century, which will certainly come in handy when we start pushing the boundaries of exploration and colonization even further! How Do We Terraform Mercury? Welcome back to another installment in the “Definitive Guide to Terraforming” series! We complete our tour of the Solar System with the planet Mercury. Someday, humans could make a home on this hostile planet, leading to the first Hermians! The planet Mercury is an intensely hot place. As the nearest planet to our Sun, surface temperatures can get up to a scorching 700 K (427° C). Ah, but there’s a flip-side to that coin. Due to it having no atmosphere to speak of, Mercury only experiences intensely hot conditions on the side that is directly facing the Sun. On the nighttime side, temperatures drop to well below freezing, as low as 100 K (-173° C). Due to its low orbital period and slow rate of rotation, the nighttime side remains in the dark for an extended period of time. What’s more, in the northern polar region, which is permanently shaded, conditions are cold enough that water is able to exist there in ice form. Because of this, and a few reasons besides, there are many who believe that humanity could colonize and even terraform parts of Mercury someday. How Do We Terraform Jupiter’s Moons? Continuing with our “Definitive Guide to Terraforming“, Universe Today is happy to present to our guide to terraforming Jupiter’s Moons. Much like terraforming the inner Solar System, it might be feasible someday. But should we? Fans of Arthur C. Clarke may recall how in his novel, 2010: Odyssey Two (or the movie adaptation called 2010: The Year We Make Contact), an alien species turned Jupiter into a new star. In so doing, Jupiter’s moon Europa was permanently terraformed, as its icy surface melted, an atmosphere formed, and all the life living in the moon’s oceans began to emerge and thrive on the surface. As we explained in a previous video (“Could Jupiter Become a Star“) turning Jupiter into a star is not exactly doable (not yet, anyway). However, there are several proposals on how we could go about transforming some of Jupiter’s moons in order to make them habitable by human beings. In short, it is possible that humans could terraform one of more of the Jovians to make it suitable for full-scale human settlement someday. How Do We Terraform Mars? As part of our continuing “Definitive Guide To Terraforming” series, Universe Today is happy to present our guide to terraforming Mars. At present, there are several plans to put astronauts and ever settlers on the Red Planet. But if we really want to live there someday, we’re going to need to do a complete planetary renovation. What will it take? Despite having a very cold and very dry climate – not to mention little atmosphere to speak of – Earth and Mars have a lot in common. These include similarities in size, inclination, structure, composition, and even the presence of water on their surfaces. Because of this, Mars is considered a prime candidate for human settlement; a prospect that includes transforming the environment to be suitable to human needs (aka. terraforming). That being said, there are also a lot of key differences that would make living on Mars, a growing preoccupation among many humans (looking at you, Elon Musk and Bas Lansdorp! ), a significant challenge. If we were to live on the planet, we would have to depend rather heavily on our technology. And if we were going to alter the planet through ecological engineering, it would take a lot of time, effort, and megatons of resources! The challenges of living on Mars are quite numerous. For starters, there is the extremely thin and unbreathable atmosphere. Whereas Earth’s atmosphere is composed of 78% nitrogen, 21% oxygen, and trace amounts of other gases, Mars’ atmosphere is made up of 96% carbon dioxide, 1.93% argon and 1.89% nitrogen, along with trace amounts of oxygen and water. Mars’ atmospheric pressure also ranges from 0.4 – 0.87 kPa, which is the equivalent of about 1% of Earth’s at sea level. The thin atmosphere and greater distance from the Sun also contributes to Mars’ cold environment, where surface temperatures average 210 K (-63 °C/-81.4 °F). Add to this the fact that Mars’ lacks a magnetosphere, and you can see why the surface is exposed to significantly more radiation than Earth’s. On the Martian surface, the average dose of radiation is about 0.67 millisieverts (mSv) per day, which is about a fifth of what people are exposed to here on Earth in the course of a year. Hence, if humans wanted to live on Mars without the need for radiation shielding, pressurized domes, bottled oxygen, and protective suits, some serious changes would need to be made. Basically, we would have to warm the planet, thicken the atmosphere, and alter the composition of said atmosphere. In 1951, Arthur C. Clarke wrote the first novel in which the terraforming of Mars was presented in fiction. Titled The Sands of Mars, the story involves Martian settlers heating up the planet by converting Mars’ moon Phobos into a second sun, and growing plants that break down the Martians sands in order to release oxygen. In 1984, James Lovelock and Michael Allaby wrote what is considered by many to be one of the most influential books on terraforming. Titled The Greening of Mars, the novel explores the formation and evolution of planets, the origin of life, and Earth’s biosphere. The terraforming models presented in the book actually foreshadowed future debates regarding the goals of terraforming. In 1992, author Frederik Pohl released Mining The Oort, a science fiction story where Mars is being terraformed using comets diverted from the Oort Cloud. Throughout the 1990s, Kim Stanley Robinson released his famous Mars Trilogy – Red Mars, Green Mars, Blue Mars – which centers on the transformation of Mars over the course of many generations into a thriving human civilization. In 2011, Yu Sasuga and Kenichi Tachibana produced the manga series Terra Formars, a series that takes place in the 21st century where scientists are attempting to slowly warm Mars. And in 2012, Kim Stanley Robinson released 2312, a story that takes place in a Solar System where multiple planets have been terraformed – which includes Mars (which has oceans). Over the past few decades, several proposals have been made for how Mars could be altered to suit human colonists. In 1964, Dandridge M. Cole released “Islands in Space: The Challenge of the Planetoids, the Pioneering Work“, in which he advocated triggering a greenhouse effect on Mars. This consisted of importing ammonia ices from the outer Solar System and then impacting them on the surface. Since ammonia (NH³) is a powerful greenhouse gas, its introduction into the Martian atmosphere would have the effect of thickening the atmosphere and raising global temperatures. As ammonia is mostly nitrogen by weight, it could also provide the necessary buffer gas which, when combined with oxygen gas, would create a breathable atmosphere for humans. Another method has to do with albedo reduction, where the surface of Mars would be coated with dark materials in order to increase the amount of sunlight it absorbs. 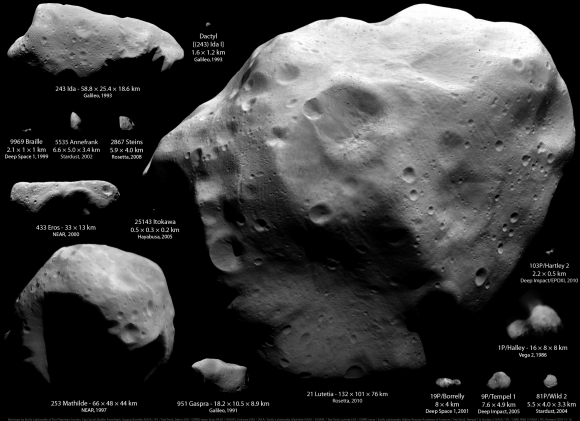 This could be anything from dust from Phobos and Deimos (two of the darkest bodies in the Solar System) to extremophile lichens and plants that are dark in color. One of the greatest proponents for this was famed author and scientist, Carl Sagan. In 1973, Sagan published an article in the journal Icarus titled “Planetary Engineering on Mars“, where he proposed two scenarios for darkening the surface of Mars. These included transporting low albedo material and/or planting dark plants on the polar ice caps to ensure they absorbed more heat, melted, and converted the planet to more “Earth-like conditions”. In 1976, NASA officially addressed the issue of planetary engineering in a study titled “On the Habitability of Mars: An Approach to Planetary Ecosynthesis“. The study concluded that photosynthetic organisms, the melting of the polar ice caps, and the introduction of greenhouse gases could all be used to create a warmer, oxygen and ozone-rich atmosphere. In 1982, Planetologist Christopher McKay wrote “Terraforming Mars”, a paper for the Journal of the British Interplanetary Society. In it, McKay discussed the prospects of a self-regulating Martian biosphere, which included both the required methods for doing so and ethics of it. This was the first time that the word terraforming was used in the title of a published article, and would henceforth become the preferred term. This was followed in 1984 by James Lovelock and Michael Allaby’s book, The Greening of Mars. In it, Lovelock and Allaby described how Mars could be warmed by importing chlorofluorocarbons (CFCs) to trigger global warming. In 1993, Mars Society founder Dr. Robert M. Zubrin and Christopher P. McKay of the NASA Ames Research Center co-wrote “Technological Requirements for Terraforming Mars“. In it, they proposed using orbital mirrors to warm the Martian surface directly. Positioned near the poles, these mirrors would be able to sublimate the CO2 ice sheet and contribute to global warming. In the same paper, they argued the possibility of using asteroids harvested from the Solar System, which would be redirected to impact the surface, kicking up dust and warming the atmosphere. In both scenarios, they advocate for the use of nuclear-electrical or nuclear-thermal rockets to haul all the necessary materials/asteroids into orbit. The use of fluorine compounds – “super-greenhouse gases” that produce a greenhouse effect thousands of times stronger than CO² – has also been recommended as a long term climate stabilizer. In 2001, a team of scientists from the Division of Geological and Planetary Sciences at Caltech made these recommendations in the “Keeping Mars warm with new super greenhouse gases“. Where this study indicated that the initial payloads of fluorine would have to come from Earth (and be replenished regularly), it claimed that fluorine-containing minerals could also be mined on Mars. This is based on the assumption that such minerals are just as common on Mars (being a terrestrial planet) which would allow for a self-sustaining process once colonies were established. Importing methane and other hydrocarbons from the outer Solar System – which are plentiful on Saturn’s moon Titan – has also been suggested. There is also the possibility of in-situ resource utilization, thanks to the Curiosity rover’s discovery of a “tenfold spike” of methane that pointed to a subterranean source. If these sources could be mined, methane might not even need to be imported. More recent proposals include the creation of sealed biodomes that would employ colonies of oxygen-producing cyanobacteria and algae on Martian soil. 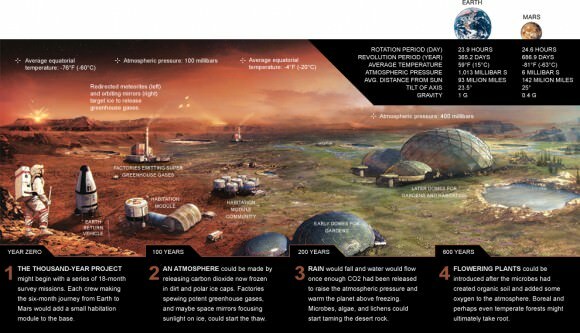 In 2014, the NASA Institute for Advanced Concepts (NAIC) program and Techshot Inc. began work on this concept, which was named the “Mars Ecopoiesis Test Bed“. In the future, the project intends to send small canisters of extremophile photosynthetic algae and cyanobacteria aboard a rover mission to test the process in a Martian environment. Beyond the prospect for adventure and the idea of humanity once again embarking on an era of bold space exploration, there are several reasons why terraforming Mars is being proposed. For starters, there is concern that humanity’s impact on planet Earth is unsustainable, and that we will need to expand and create a “backup location” if we intend to survive in the long run. This school of though cites things like the Earth’s growing population – which is expected to reach 9.6 billion by mid-century – as well as the fact that by 2050, roughly two-thirds of the world’s population is expected to live in major cities. On top of that, there is the prospect of severe Climate Change, which – according to a series of scenarios computed by NASA – could result in life becoming untenable on certain parts of the planet by 2100. Other reasons emphasize how Mars lies within our Sun’s “Goldilocks Zone” (aka. “habitable zone), and was once a habitable planet. Over the past few decades, surface missions like NASA’s Mars Science Laboratory (MSL) and its Curiosity rover have uncovered a wealth of evidence that points to flowing water existing on Mars in the deep past (as well as the existence of organic molecules). In addition, NASA’s Mars Atmosphere and Volatile EvolutioN Mission (MAVEN) (and other orbiters) have provided extensive information on Mars’ past atmosphere. What they have concluded is that roughly 4 billion years ago, Mars had abundant surface water and a thicker atmosphere. However, due to the loss of Mars’ magnetosphere – which may have been caused by a large impact or rapid cooling of the planet’s interior – the atmosphere was slowly stripped away. Ergo, if Mars was once habitable and “Earth-like”, it is possible that it could be again one day. And if indeed humanity is looking for a new world to settle on, it only makes sense that it be on one that has as much in common with Earth as possible. In addition, it has also been argued that our experience with altering the climate of our own planet could be put to good use on Mars. For centuries, our reliance on industrial machinery, coal and fossil fuels has had a measurable effect Earth’s environment. And whereas this has been an unintended consequence of modernization and development here on Earth; on Mars, the burning of fossil fuels and the regular release of pollution into the air would have a positive effect. Other reasons include expanding our resources base and becoming a “post-scarcity” society. A colony on Mars could allow for mining operations on the Red Planet, where both minerals and water ice are abundant and could be harvested. A base on Mars could also act as a gateway to the Asteroid Belt, which would provide us with access to enough minerals to last us indefinitely. Without a doubt, the prospect of terraforming Mars comes with its share of problems, all of which are particularly daunting. For starters, there is the sheer amount of resources it would take to convert Mars’ environment into something sustainable for humans. Second, there is the concern that any measure undertaken could have unintended consequences. And third, there is the amount of time it would take. For example, when it comes to concepts that call for the introduction of greenhouse gases to trigger warming, the quantities required are quite staggering. The 2001 Caltech study, which called for the introduction of fluorine compounds, indicated that sublimating the south polar CO² glaciers would require the introduction of approximately 39 million metric tons of CFCs into Mars’ atmosphere – which is three times the amounts produced on Earth between 1972 and 1992. Photolysis would also begin to break down the CFCs the moment they were introduced, which would necessitate the additional of 170 kilotons every year to replenish the losses. And last, the introduction of CFCs would also destroy the Martian any ozone that was produced, which would undermine efforts to shield to surface from radiation. The study goes on to state that this could be drastically reduced by creating extremophile organisms specifically adapted for the harsh Martian environment, creating a greenhouse effect and melting the polar ice caps. However, the amount of time it would take to transform Mars would still likely be on the order of centuries or millennia. And of course, there is the problem of infrastructure. 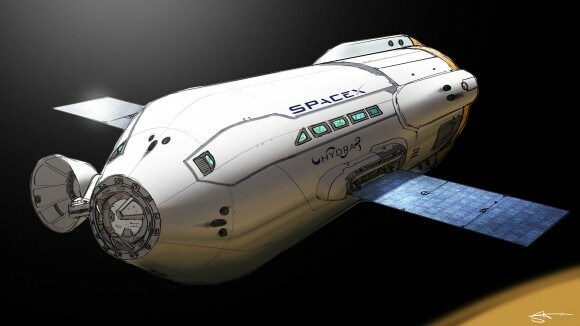 Harvesting resources from other planets or moons in the Solar System would require a large fleet of space haulers, and they would need to be equipped with advanced drive systems to make the trip in a reasonable amount of time. Currently, no such drive systems exist, and conventional methods – ranging from ion engines to chemical propellants – are neither fast or economical enough. To illustrate, NASA’s New Horizons mission took more than 11 years to get make its historic rendezvous with Pluto in the Kuiper Belt, using conventional rockets and the gravity-assist method. Meanwhile, the Dawn mission, which relied relied on ionic propulsion, took almost four years to reach Vesta in the Asteroid Belt. Neither method is practical for making repeated trips to the Kuiper Belt and hauling back icy comets and asteroids, and humanity has nowhere near the number of ships we would need to do this. On the other hand, going the in-situ route – which would involve factories or mining operations on the surface to release CO², methane or CFC-containing minerals into the air – would require several heavy-payload rockets to get all the machinery to the Red Planet. The cost of this would dwarf all space programs to date. And once they were assembled on the surface (either by robotic or human workers), these operations would have to be run continuously for centuries. There is also several questions about the ethics of terraforming. Basically, altering other planets in order to make them more suitable to human needs raises the natural question of what would happen to any lifeforms already living there. If in fact Mars does have indigenous microbial life (or more complex lifeforms), which many scientists suspect, then altering the ecology could impact or even wipe out these lifeforms. In short, future colonists and terrestrial engineers would effectively be committing genocide. Given all of these arguments, one has to wonder what the benefits of terraforming Mars would be. While the idea of utilizing the resources of the Solar System makes sense in the long-run, the short-term gains are far less tangible. Basically, harvested resources from other worlds is not economically viable when you can extract them here at home for much less. And given the danger, who would want to go? But as ventures like MarsOne have shown, there are plenty of human beings who are willing to make a one-way trip to Mars and act as Earth’s “first-wave” of intrepid explorers. In addition, NASA and other space agencies have been very vocal about their desire to explore the Red Planet, which includes manned missions by the 2030s. And as various polls show, public support is behind these endevours, even if it means drastically increased budgets. So why do it? Why terraform Mars for human use? Because it is there? Sure. But more importantly, because we might need to. And the drive and the desire to colonize it is also there. And despite the difficulty inherent in each, there is no shortage of proposed methods that have been weighed and determined feasible.In the end, all that’s needed is a lot of time, a lot of commitment, a lot of resources, and a lot of care to make sure we are not irrevocably harming life forms that are already there. But of course, should our worst predictions come to pass, we may find in the end that we have little choice but to make a home somewhere else in the Solar System. As this century progresses, it may very well be Mars or bust! We have written many interesting articles about terraforming here at Universe Today. Here’s The Definitive Guide To Terraforming, Could We Terraform the Moon?, Should We Terraform Mars?, How Do We Terraform Venus?, and Student Team Wants to Terraform Mars Using Cyanobacteria. And if you like the video, come check out our Patreon page and find out how you can get these videos early while helping us bring you more great content! Terraforming. Chances are you’ve heard that word thrown around before, most likely in the context of some science fiction story. However, in recent years, thanks to renewed interest in space exploration, this word is being used in an increasingly serious manner. And rather than being talked about like a far-off prospect, the issue of terraforming other worlds is being addressed as a near-future possibility. Whether it’s Elon Musk claiming that humanity needs a “backup location” in order to survive, private ventures like MarsOne looking to send humans on a one-way mission to colonize the Red Planet, or space agencies like NASA and the ESA discussing the prospect of long-term habitability on Mars or the Moon, terraforming is yet another science fiction concept that appears to be moving towards science fact. But just what does terraforming entail? Where exactly could we go about using this process? What kind of technology would we need? Does such technology already exist, or do we have to wait? How much in the way of resources would it take? And above all, what are the odds of it actually succeeding? Answering any or all of these questions requires that we do a bit of digging. Not only is terraforming a time-honored concept, but as it turns out, humanity already has quite a bit of experience in this area! To break it down, terraforming is the process whereby a hostile environment (i.e. a planet that is too cold, too hot, and/or has an unbreathable atmosphere) is altered in order to be suitable for human life. This could involve modifying the temperature, atmosphere, surface topography, ecology – or all of the above – in order to make a planet or moon more “Earth-like”. The term was coined by Jack Williamson, an American science fiction writer who has also been called “the Dean of science fiction” (after the death of Robert Heinlein in 1988). The term appeared as part of a science-fiction story titled “Collision Orbit”, which was published in the 1942 editions of the magazine Astounding Science Fiction. This is the first known mention of the concept, though there are examples of it appearing in fiction beforehand. Science fiction is filled with examples of altering planetary environments to be more suitable to human life, many of which predate the scientific studies by many decades. For example, in H.G. Wells’ War of the Worlds, he mentions at one point how the Martian invaders begin transforming Earth’s ecology for the sake of long-term habitation. In Olaf Stapleton’s Last And First Men (1930), two chapter are dedicated to describing how humanity’s descendants terraform Venus after Earth becomes uninhabitable; and in the process, commit genocide against the native aquatic life. By the 1950s and 60s, owing to the beginning of the Space Age, terraforming began to appear in works of science fiction with increasing frequency. One such example is Farmer in the Sky (1950) by Robert A. Heinlein. In this novel, Heinlein offers a vision of Jupiter’s moon Ganymede, which is being transformed into an agricultural settlement. This was a very significant work, in that it was the first where the concept of terraforming is presented as a serious and scientific matter, rather than the subject of mere fantasy. In 1951, Arthur C. Clarke wrote the first novel in which the terraforming of Mars was presented in fiction. Titled The Sands of Mars, the story involves Martian settlers heating up the planet by converting Mars’ moon Phobos into a second sun, and growing plants that break down the Martians sands in order to release oxygen. In his seminal book 2001: A Space Odyssey – and it’s sequel, 2010: Odyssey Two – Clarke presents a race of ancient beings (“Firstborn”) turning Jupiter into a second sun so that Europa will become a life-bearing planet. Poul Anderson also wrote extensively about terraforming in the 1950s. In his 1954 novel, The Big Rain, Venus is altered through planetary engineering techniques over a very long period of time. The book was so influential that the term term “Big Rain” has since come to be synonimous with the terraforming of Venus. This was followed in 1958 by the Snows of Ganymede, where the Jovian moon’s ecology is made habitable through a similar process. In Issac Asimov’s Robot series, colonization and terraforming is performed by a powerful race of humans known as “Spacers”, who conduct this process on fifty planets in the known universe. In his Foundation series, humanity has effectively colonized every habitable planet in the galaxy and terraformed them to become part of the Galactic Empire. In the 1990s, Kim Stanley Robinson released his famous trilogy that deals with the terraforming of Mars. Known as the Mars Trilogy – Red Mars, Green Mars, Blue Mars – this series centers on the transformation of Mars over the course of many generations into a thriving human civilization. This was followed up in 2012 with the release of 2312, which deals with the colonization of the Solar System – including the terraforming of Venus and other planets. Countless other examples can be found in popular culture, ranging from television and print to films and video games. In an article published by the journal Science in 1961, famed astronomer Carl Sagan proposed using planetary engineering techniques to transform Venus. 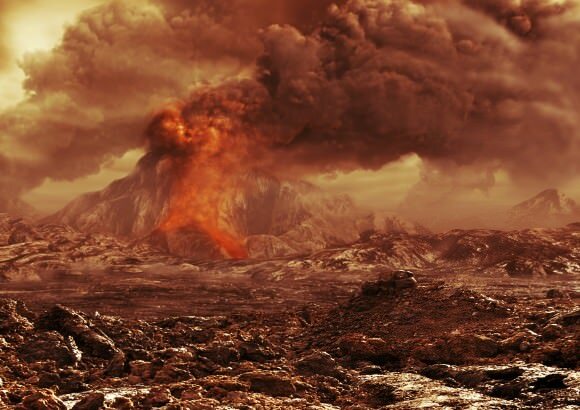 This involved seeding the atmosphere of Venus with algae, which would convert the atmosphere’s ample supplies of water, nitrogen and carbon dioxide into organic compounds and reduce Venus’ runaway greenhouse effect. In 1973, he published an article in the journal Icarus titled “Planetary Engineering on Mars“, where he proposed two scenarios for transforming Mars. These included transporting low albedo material and/or planting dark plants on the polar ice caps to ensure it absorbed more heat, melted, and converted the planet to more “Earth-like conditions”. In 1976, NASA addressed the issue of planetary engineering officially in a study titled “On the Habitability of Mars: An Approach to Planetary Ecosynthesis“. The study concluded that photosynthetic organisms, the melting of the polar ice caps, and the introduction of greenhouse gases could all be used to create a warmer, oxygen and ozone-rich atmosphere. The first conference session on terraforming, then referred to as “Planetary Modeling”, was organized that same year. And then in March of 1979, NASA engineer and author James Oberg organized the First Terraforming Colloquium – a special session at the Tenth Lunar and Planetary Science Conference, which is held annually in Houston, Texas. In 1981, Oberg popularized the concepts that were discussed at the colloquium in his book New Earths: Restructuring Earth and Other Planets . This was followed by James Lovelock and Michael Allaby’s The Greening of Mars in 1984. This book was one of the first to describe a novel method of warming Mars, where chlorofluorocarbons (CFCs) are added to the atmosphere in order to trigger global warming. This book motivated biophysicist Robert Haynes to begin promoting terraforming as part of a larger concept known as Ecopoiesis. Derived from the Greek words oikos (“house”) and poiesis (“production”), this word refers to the origin of an ecosystem. In the context of space exploration, it involves a form of planetary engineering where a sustainable ecosystem is fabricated from an otherwise sterile planet. As described by Haynes, this begins with the seeding of a planet with microbial life, which leads to conditions approaching that of a primordial Earth. This is then followed by the importation of plant life, which accelerates the production of oxygen, and culminates in the introduction of animal life. In 2009, Kenneth Roy – an engineer with the US Department of Energy – presented his concept for a “Shell World” in a paper published with the Journal of British Interplanetary Sciences. Titled “Shell Worlds – An Approach To Terraforming Moons, Small Planets and Plutoids“, his paper explored the possibility of using a large “shell” to encase an alien world, keeping its atmosphere contained long enough for long-term changes to take root. There is also the concepts where a usable part of a planet is enclosed in an dome in order to transform its environment, which is known as “paraterraforming”. This concept, originally coined by British mathematician Richard L.S. Talyor in his 1992 publication Paraterraforming – The worldhouse concept, could be used to terraform sections of several planets that are otherwise inhospitable, or cannot be altered in whole. Within the Solar System, several possible locations exist that could be well-suited to terraforming. Consider the fact that besides Earth, Venus and Mars also lie within the Sun’s Habitable Zone (aka. “Goldilocks Zone”). However, owing to Venus’ runaway greenhouse effect, and Mars’ lack of a magnetosphere, their atmospheres are either too thick and hot, or too thin and cold, to sustain life as we know it. However, this could theoretically be altered through the right kind of ecological engineering. Other potential sites in the Solar System include some of the moons that orbit the gas giants. Several Jovian (i.e. in orbit of Jupiter) and Cronian (in orbit of Saturn) moons have an abundance of water ice, and scientists have speculated that if the surface temperatures were increased, viable atmospheres could be created through electrolysis and the introduction of buffer gases. There is even speculation that Mercury and the Moon (or at least parts thereof) could be terraformed in order to be suitable for human settlement. In these cases, terraforming would require not only altering the surface, but perhaps also adjusting their rotation. In the end, each case presents its own share of advantages, challenges, and likelihoods for success. Let’s consider them in order of distance from the Sun. The terrestrial planets of our Solar System present the best possibilities for terraforming. Not only are they located closer to our Sun, and thus in a better position to absorb its energy, but they are also rich in silicates and minerals – which any future colonies will need to grow food and build settlements. And as already mentioned, two of these planets (Venus and Mars) are located within Earth’s habitable zone. The vast majority of Mercury’s surface is hostile to life, where temperatures gravitate between extremely hot and cold – i.e. 700 K (427 °C; 800 °F) 100 K (-173 °C; -280 °F). This is due to its proximity to the Sun, the almost total lack of an atmosphere, and its very slow rotation. However, at the poles, temperatures are consistently low -93 °C (-135 °F) due to it being permanently shadowed. The presence of water ice and organic molecules in the northern polar region has also been confirmed thanks to data obtained by the MESSENGER mission. Colonies could therefore be constructed in the regions, and limited terraforming (aka. paraterraforming) could take place. For example, if domes (or a single dome) of sufficient size could be built over the Kandinsky, Prokofiev, Tolkien and Tryggvadottir craters, the norther region could be altered for human habitation. Theoretically, this could be done by using mirrors to redirect sunlight into the domes which would gradually raise the temperature. The water ice would then melt, and when combined with organic molecules and finely ground sand, soil could be made. Plants could then be grown to produce oxygen, which combined with nitrogen gas, would produce a breathable atmosphere. As “Earth’s Twin“, there are many possibilities and advantages to terraforming Venus. The first to propose this was Sagan with his 1961 article in Science. However, subsequent discoveries – such as the high concentrations of sulfuric acid in Venus’ clouds – made this idea unfeasible. Even if algae could survive in such an atmosphere, converting the extremely dense clouds of CO² into oxygen would result in an over-dense oxygen environment. In addition, graphite would become a by-product of the chemical reactions, which would likely form into a thick powder on the surface. This would become CO² again through combustion, thus restarting the entire greenhouse effect. However, more recent proposals have been made that advocate using carbon sequestration techniques, which are arguably much more practical. In these scenarios, chemical reactions would be relied on to convert Venus’ atmosphere to something breathable while also reducing its density. In one scenario, hydrogen and iron aerosol would be introduced to convert the CO² in the atmosphere into graphite and water. This water would then fall to the surface, where it cover roughly 80% of the planet – due to Venus having little variation in elevation. Another scenario calls for the introduction of vast amounts of calcium and magnesium into the atmosphere. This would sequester carbon in the form of calcium and magnesium carbonites. And advantage to this plan is that Venus already has deposits of both minerals in its mantle, which could then be exposed to the atmosphere through drilling. However, most of the minerals would have to come from off-world in order to reduce the temperature and pressure to sustainable levels. Yet another proposal is to freeze the atmospheric carbon dioxide down to the point of liquefaction – where it forms dry ice – and letting it accumulate on the surface. Once there, it could be buried and would remain in a solid state due to pressure, and even mined for local and off-world use. And then there is the possibility of bombarding the surface with icy comets (which could be mined from one of Jupiter’s or Saturn’s moons) to create a liquid ocean on the surface, which would sequester carbon and aid in any other of the above processes. Last, there is the scenario in which Venus’ dense atmosphere could be removed. This could be characterized as the most direct approach to thinning an atmosphere which is far too dense for human occupation. By colliding large comets or asteroids into the surface, some of the dense CO² clouds could be blasted into space, thus leaving less atmosphere to be converted. A slower method could be achieved using mass drivers (aka. electromagnetic catapults) or space elevators, which would gradually scoop up the atmosphere and either lift it into space, or fire it away from the surface. And beyond altering or removing the atmosphere, there are also concepts that call for reducing the heat and pressure by either limiting sunlight (i.e. with solar shades) or altering the planet’s rotational velocity. The concept of solar shades involves using either a series of small spacecraft or a single large lens to divert sunlight from a planet’s surface, thus reducing global temperatures. For Venus, which absorbs twice as much sunlight as Earth, solar radiation is believed to have played a major role in the runaway greenhouse effect that has made it what it is today. Such a shade could be space-based, located in the Sun–Venus L1 Lagrangian Point, where it would not only prevent some sunlight from reaching Venus, but also serve to reduce the amount of radiation Venus is exposed to. Alternately, solar shades or reflectors could be placed in the atmosphere or on the surface. This could consist of large reflective balloons, sheets of carbon nanotubes or graphene, or low-albedo material. Placing shades or reflectors in the atmosphere offers two advantages: for one, atmospheric reflectors could be built in-situ, using locally-sourced carbon. Second, Venus’ atmosphere is dense enough that such structures could easily float atop the clouds. However, the amount of material would have to be large and would have to remain in place long after the atmosphere had been modified. Also, since Venus already has highly reflective clouds, any approach would have to significantly surpass its current albedo (0.65) to make a difference. Also, the idea of speeding up Venus’ rotation has been floating around as a possible means of terraforming. If Venus could be spun-up to the point where its diurnal (day-night) cycle were similar to Earth’s, the planet might just begin to generate a stronger magnetic field. This would have the effect of reducing the amount of solar wind (and hence radiation) from reaching the surface, thus making it safer for terrestrial organisms. As Earth’s closest celestial body, colonizing the Moon would be comparatively easy compared to other bodies. But when it comes to terraforming the Moon, the possibilities and challenges closely resemble those of Mercury. For starters, the Moon has an atmosphere that is so thin that it can only be referred to as an exosphere. What’s more, the volatile elements that are necessary for life are in short supply (i.e. hydrogen, nitrogen, and carbon). These problems could be addressed by capturing comets that contain water ices and volatiles and crashing them into the surface. The comets would sublimate, dispersing these gases and water vapor to create an the atmosphere. These impacts would also liberate water that is contained in the lunar regolith, which could eventually accumulate on the surface to form natural bodies of water. The transfer of momentum from these comet would also get the Moon rotating more rapidly, speeding up its rotation so that it would no longer be tidally-locked. A Moon that was sped up to rotate once on its axis every 24 hours would have a steady diurnal cycle, which would make colonization and adapting to life on the Moon easier. There is also the possibility of paraterraforming parts of the Moon in a way that would be similar to terraforming Mercury’s polar region. In the Moon’s case, this would take place in the Shackleton Crater, where scientists have already found evidence of water ice. Using solar mirrors and a dome, this crater could be turned into a micro-climate where plants could be grown and a breathable atmosphere created. When it comes to terraforming, Mars is the most popular destination. There are several reasons for this, ranging from its proximity to Earth, its similarities to Earth, and the fact that it once had an environment that was very similar to Earth’s – which included a thicker atmosphere and the presence of warm, flowing water on the surface. Lastly, it is currently believed that Mars may have additional sources of water beneath its surface. In brief, Mars has a diurnal and seasonal cycle that are very close what we experience here on Earth. In the former case, a single day on Mars lasts 24 hours and 40 minutes. In the latter case, and owing to Mars similarly tilted axis (25.19° compared to Earth’s 23°), Mars experiences seasonal changes that are very similar to Earth’s. Though a single season on Mars lasts roughly twice as long, the temperature variation that results is very similar – ±178 °C (320°F) compared to Earth’s ±160 °C (278°F). Beyond these, Mars would need to undergo vast transformations in order for human beings to live on its surface. The atmosphere would need to be thickened drastically, and its composition would need to be changed. Currently, Mars’ atmosphere is composed of 96% carbon dioxide, 1.93% argon and 1.89% nitrogen, and the air pressure is equivalent to only 1% of Earth’s at sea level. Above all, Mars lacks a magnetosphere, which means that its surface receives significantly more radiation than we are used to here on Earth. In addition, it is believed that Mars once had a magnetosphere, and that the disappearance of this magnetic field led to solar wind to stripping away Mars’ atmosphere. This in turn is what led Mars to become the cold, desiccated place it is today. Ultimately, this means that in order for the planet to become habitable by human standards, it’s atmosphere would need to be significantly thickened and the planet significantly warmed. The composition of the atmosphere would need to change as well, from the current CO²-heavy mix to an nitrogen-oxygen balance of about 70/30. And above all, the atmosphere would need to be replenished every so often to compensate for loss. Luckily, the first three requirements are largely complimentary, and present a wide range of possible solutions. For starters, Mars’ atmosphere could be thickened and the planet warmed by bombarding its polar regions with meteors. These would cause the poles to melt, releasing their deposits of frozen carbon dioxide and water into the atmosphere and triggering a greenhouse effect. The introduction of volatile elements, such as ammonia and methane, would also help to thicken the atmosphere and trigger warming. Both could be mined from the icy moons of the outer Solar System, particularly from the moons of Ganymede, Callisto, and Titan. These could also be delivered to the surface via meteoric impacts. After impacting on the surface, the ammonia ice would sublimate and break down into hydrogen and nitrogen – the hydrogen interacting with he CO² to form water and graphite, while the nitrogen acts as a buffer gas. The methane, meanwhile, would act as a greenhouse gas that would further enhance global warming. In addition, the impacts would throw tons of dust into the air, further fueling the warming trend. In time, Mars’ ample supplies of water ice – which can be found not only in the poles but in vast subsurface deposits of permafrost – would all sublimate to form warm, flowing water. And with significantly increased air pressure and a warmer atmosphere, humans might be able to venture out onto the surface without the need for pressure suits. However, the atmosphere will still need to be converted into something breathable. This will be far more time-consuming, as the process of converting the atmospheric CO² into oxygen gas will likely take centuries. In any case, several possibilities have been suggested, which include converting the atmosphere through photosynthesis – either with cyanobacteria or Earth plants and lichens. 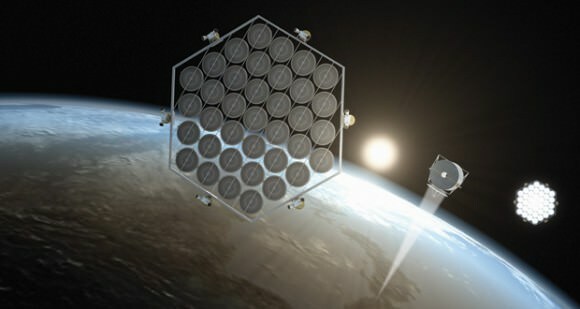 Other suggestions include building orbital mirrors, which would be placed near the poles and direct sunlight onto the surface to trigger a cycle of warming by causing the polar ice caps to melt and release their CO² gas. Using dark dust from Phobos and Deimos to reduce the surface’s albedo, thus allowing it to absorb more sunlight, has also been suggested. Beyond the Inner Solar System, there are several sites that would make for good terraforming targets as well. Particularly around Jupiter and Saturn, there are several sizable moons – some of which are larger than Mercury – that have an abundance of water in the form of ice (and in some cases, maybe even interior oceans). At the same time, many of these same moons contain other necessary ingredients for functioning ecosystems, such as frozen volatiles – like ammonia and methane. Because of this, and as part of our ongoing desire to explore farther out into our Solar System, many proposals have been made to seed these moons with bases and research stations. Some plans even include possible terraforming to make them suitable for long-term habitation. Jupiter’s largest moons, Io, Europa, Ganymede and Callisto – known as the Galileans, after their founder (Galileo Galilei) – have long been the subject of scientific interest. For decades, scientists have speculated about the possible existence of a subsurface ocean on Europa, based on theories about the planet’s tidal heating (a consequence of its eccentric orbit and orbital resonance with the other moons). Analysis of images provided by the Voyager 1 and Galileo probes added weight to this theory, showing regions where it appeared that the subsurface ocean had melted through. What’s more, the presence of this warm water ocean has also led to speculation about the existence of life beneath Europa’s icy crust – possibly around hydrothermal vents at the core-mantle boundary. Because of this potential for habitability, Europa has also been suggested as a possible site for terraforming. As the argument goes, if the surface temperature could be increased, and the surface ice melted, the entire planet could become a ocean world. Sublimation of the ice, which would release water vapor and gaseous volatiles, would then be subject to electrolysis (which already produces a thin oxygen atmosphere). However, Europa has no magnetosphere of its own, and lies within Jupiter’s powerful magnetic field. As a result, its surface is exposed to significant amounts of radiation – 540 rem of radiation per day compared to about 0.0030 rem per year here on Earth – and any atmosphere we create would begin to be stripped away by Jupiter. Ergo, radiation shielding would need to be put in place that could deflect the majority of this radiation. And then there is Ganymede, the third most-distant of Jupiter’s Galilean moons. Much like Europa, it is a potential site of terraforming, and presents numerous advantages. 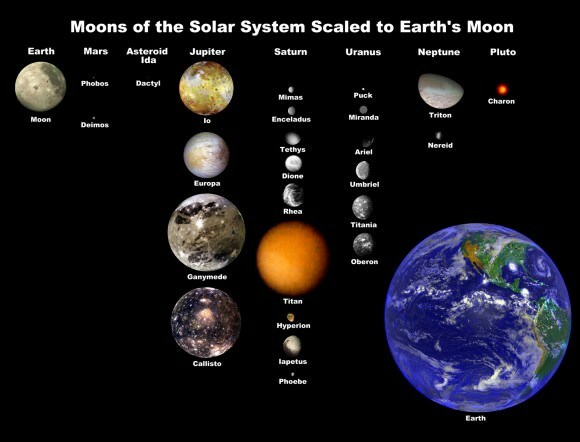 For one, it is the largest moon in our Solar System, larger than our own moon and even larger that the planet Mercury. In addition, it also has ample supplies of water ice, is believed to have an interior ocean, and even has its own magnetosphere. Hence, if the surface temperature were increased and the ice sublimated, Ganymede’s atmosphere could be thickened. Like Europa, it would also become an ocean planet, and its own magnetosphere would allow for it to hold on to more of its atmosphere. However, Jupiter’s magnetic field still exerts a powerful influence over the planet, which means radiation shields would still be needed. Lastly, there is Callisto, the fourth-most distant of the Galileans. Here too, abundant supplies of water ice, volatiles, and the possibility of an interior ocean all point towards the potential for habitability. But in Callisto’s case, there is the added bonus of it being beyond Jupiter’s magnetic field, which reduces the threat of radiation and atmospheric loss. The process would begin with surface heating, which would sublimate the water ice and Callisto’s supplies of frozen ammonia. From these oceans, electrolysis would lead to the formation of an oxygen-rich atmosphere, and the ammonia could be converted into nitrogen to act as a buffer gas. However, since the majority of Callisto is ice, it would mean that the planet would lose considerable mass and have no continents. Again, an ocean planet would result, necessitated floating cities or massive colony ships. Much like the Jovian Moons, Saturn’s Moons (also known as the Cronian) present opportunities for terraforming. Again, this is due to the presence of water ice, interior oceans, and volatile elements. Titan, Saturn’s largest moon, also has an abundance of methane that comes in liquid form (the methane lakes around its northern polar region) and in gaseous form in its atmosphere. Large caches of ammonia are also believed to exist beneath he surface ice. Titan is also the only natural satellite to have a dense atmosphere (one and half times the pressure of Earth’s) and the only planet outside of Earth where the atmosphere is nitrogen-rich. Such a thick atmosphere would mean that it would be far easier to equalize pressure for habitats on the planet. What’s more, scientists believe this atmosphere is a prebiotic environment rich in organic chemistry – i.e. similar to Earth’s early atmosphere (only much colder). As such, converting it to something Earth-like would be feasible. First, the surface temperature would need to be increased. Since Titan is very distant from the Sun, and already has an abundance of greenhouse gases, this could only be accomplished through orbital mirrors. This would sublimate the surface ice, releasing ammonia beneath, which would lead to more heating. The next step would involve converting the atmosphere to something breathable. As already noted, Titan’s atmosphere is nitrogen-rich, which would remove the need for introducing a buffer gas. And with the availability of water, oxygen could be introduced by generating it through electrolysis. At the same time, the methane and other hydrocarbons would have to be sequestered, in order to prevent an explosive mixture with the oxygen. But given the thickness and multi-layered nature of Titan’s ice, which is estimated to account for half of its mass, the moon would be very much an ocean planet- i.e. with no continents or landmasses to build on. So once again, any habitats would have to take the form of either floating platforms or large ships. Enceladus is another possibility, thanks to the recent discovery of a subsurface ocean. Analysis by the Cassini space probe of the water plumes erupting from its southern polar region also indicated the presence of organic molecules. As such, terraforming it would be similar to terraforming Jupiter’s moon of Europa, and would yield a similar ocean moon. Again, this would likely have to involve orbital mirrors, given Enceladus’ distance from our Sun. Once the ice began to sublimate, electrolysis would generate oxygen gas. The presence of ammonia in the subsurface ocean would also be released, helping to raise the temperature and serving as a source of nitrogen gas, with which to buffer the atmosphere. In addition to the Solar System, extra-solar planets (aka. exoplanets) are also potential sites for terraforming. Of the 1,941 confirmed exoplanets discovered so far, these planets are those that have been designated “Earth-like. In other words, they are terrestrial planets that have atmospheres and, like Earth, occupy the region around a star where the average surface temperature allows for liquid water (aka. habitable zone). The first planet confirmed by Kepler to have an average orbital distance that placed it within its star’s habitable zone was Kepler-22b. This planet is located about 600 light years from Earth in the constellation of Cygnus, was first observed on May 12th, 2009 and then confirmed on Dec 5th, 2011. Based on all the data obtained, scientists believe that this world is roughly 2.4 times the radius of Earth, and is likely covered in oceans or has a liquid or gaseous outer shell. In addition, there are star systems with multiple “Earth-like” planets occupying their habitable zones. Gliese 581 is a good example, a red dwarf star that is located 20.22 light years away from Earth in the Libra constellation. Here, three confirmed and two possible planets exist, two of which are believed to orbit within the star’s habitable zone. These include the confirmed planet Gliese 581 d and the hypothetical Gliese 581 g.
Tau Ceti is another example. This G-class star, which is located roughly 12 light years from Earth in the constellation Cetus, has five possible planets orbiting it. Two of these are Super-Earths that are believed to orbit the star’s habitable zone – Tau Ceti e and Tau Ceti f. However, Tau Ceti e is believed to be too close for anything other than Venus-like conditions to exist on its surface. In all cases, terraforming the atmospheres of these planet’s would most likely involve the same techniques used to terraform Venus and Mars, though to varying degrees. For those located on the outer edge of their habitable zones, terraforming could be accomplished by introducing greenhouse gases or covering the surface with low albedo material to trigger global warming. On the other end, solar shades and carbon sequestering techniques could reduce temperatures to the point where the planet is considered hospitable. When addressing the issue of terraforming, there is the inevitable question – “why should we?” Given the expenditure in resources, the time involved, and other challenges that naturally arise (see below), what reasons are there to engage in terraforming? As already mentioned, there is the reasons cited by Musk, about the need to have a “backup location” to prevent any particular cataclysm from claiming all of humanity. Putting aside for the moment the prospect of nuclear holocaust, there is also the likelihood that life will become untenable on certain parts of our planet in the coming century. As the NOAA reported in March of 2015, carbon dioxide levels in the atmosphere have now surpassed 400 ppm, a level not seen since the the Pliocene Era – when global temperatures and sea level were significantly higher. And as a series of scenarios computed by NASA show, this trend is likely to continue until 2100, and with serious consequences. In one scenario, carbon dioxide emissions will level off at about 550 ppm toward the end of the century, resulting in an average temperature increase of 2.5 °C (4.5 °F). In the second scenario, carbon dioxide emissions rise to about 800 ppm, resulting in an average increase of about 4.5 °C (8 °F). Whereas the increases predicted in the first scenario are sustainable, in the latter scenario, life will become untenable on many parts of the planet. As a result of this, creating a long-term home for humanity on Mars, the Moon, Venus, or elsewhere in the Solar System may be necessary. In addition to offering us other locations from which to extract resources, cultivate food, and as a possible outlet for population pressures, having colonies on other worlds could mean the difference between long-term survival and extinction. There is also the argument that humanity is already well-versed in altering planetary environments. For centuries, humanity’s reliance on industrial machinery, coal and fossil fuels has had a measurable effect Earth’s environment. And whereas the Greenhouse Effect that we have triggered here was not deliberate, our experience and knowledge in creating it here on Earth could be put to good use on planet’s where surface temperatures need to be raised artificially. In addition, it has also been argued that working with environments where there is a runaway Greenhouse Effect – i.e. Venus – could yield valuable knowledge that could in turn be used here on Earth. Whether it is the use of extreme bacteria, introducing new gases, or mineral elements to sequester carbon, testing these methods out on Venus could help us to combat Climate Change here at home. It has also been argued that Mars’ similarities to Earth are a good reason to terraform it. Essentially, Mars once resembled Earth, until its atmosphere was stripped away, causing it to lose virtually all the liquid water on its surface. Ergo, terraforming it would be tantamount to returning it to its once-warm and watery glory. The same argument could be made of Venus, where efforts to alter it would restore it to what it was before a runaway Greenhouse Effect turned it into the harsh, extremely hot world it is today. Last, but not least, there is argument that colonizing the Solar System could usher in an age of “post-scarcity”. If humanity were to build outposts and based on other worlds, mine the asteroid belt and harvest the resources of the Outer Solar System, we would effectively have enough minerals, gases, energy, and water resources to last us indefinitely. It could also help trigger a massive acceleration in human development, defined by leaps and bounds in technological and social progress. Case in point, all of the potential ideas for terraforming Venus and Mars involve infrastructure that does not yet exist and would be very expensive to create. For instance, the orbital shade concept that would cool Venus calls for a structure that would need to be four times the diameter of Venus itself (if it were positioned at L1). It would therefore require megatons of material, all of which would have to be assembled on site. In contrast, increasing the speed of Venus’s rotation would require energy many orders of magnitude greater than the construction of orbiting solar mirrors. As with removing Venus’ atmosphere, the process would also require a significant number of impactors that would have to be harnessed from the outer solar System – mainly from the Kuiper Belt. In order to do this, a large fleet of spaceships would be needed to haul them, and they would need to be equipped with advanced drive systems that could make the trip in a reasonable amount of time. Currently, no such drive systems exist, and conventional methods – ranging from ion engines to chemical propellants – are neither fast or economical enough. The Moon’s proximity makes it an attractive option for terraforming. But again, the resources needed – which would likely include several hundred comets – would again need to be imported from the outer Solar System. And while Mercury’s resources could be harvested in-situ or brought from Earth to paraterraform its northern polar region, the concept still calls for a large fleet of ships and robot builders which do not yet exist. The outer Solar System presents a similar problem. In order to begin terraforming these moons, we would need infrastructure between here and there, which would mean bases on the Moon, Mars, and within the Asteroid Belt. Here, ships could refuel as they transport materials to the Jovian sand Cronian systems, and resources could be harvested from all three of these locations as well as within the systems themselves. But of course, it would take many, many generations (or even centuries) to build all of that, and at considerable cost. Ergo, any attempts at terraforming the outer Solar System would have to wait until humanity had effectively colonized the inner Solar System. And terraforming the Inner Solar System will not be possible until humanity has plenty of space hauler on hand, not to mention fast ones! The necessity for radiation shields also presents a problem. The size and cost of manufacturing shields that could deflect Jupiter’s magnetic field would be astronomical. And while the resources could be harvest from the nearby Asteroid Belt, transporting and assembling them in space around the Jovian Moons would again require many ships and robotic workers. And again, there would have to be extensive infrastructure between Earth and the Jovian system before any of this could proceed. As for item three, there are plenty of problems that could result from terraforming. For instance, transforming Jupiter’s and Saturn’s moons into ocean worlds could be pointless, as the volume of liquid water would constitute a major portion of the moon’s overall radius. Combined with their low surface gravities, high orbital velocities and the tidal effects of their parent planets, this could lead to severely high waves on their surfaces. In fact, these moons could become totally unstable as a result of being altered. There is also several questions about the ethics of terraforming. Basically, altering other planets in order to make them more suitable to human needs raises the natural question of what would happen to any lifeforms already living there. If in fact Mars and other Solar System bodies have indigenous microbial (or more complex) life, which many scientists suspect, then altering their ecology could impact or even wipe out these lifeforms. In short, future colonists and terrestrial engineers would effectively be committing genocide. Another argument that is often made against terraforming is that any effort to alter the ecology of another planet does not present any immediate benefits. Given the cost involved, what possible incentive is there to commit so much time, resources and energy to such a project? While the idea of utilizing the resources of the Solar System makes sense in the long-run, the short-term gains are far less tangible. Basically, harvested resources from other worlds is not economically viable when you can extract them here at home for much less. And real-estate is only the basis of an economic model if the real-estate itself is desirable. While MarsOne has certainly shown us that there are plenty of human beings who are willing to make a one-way trip to Mars, turning the Red Planet, Venus or elsewhere into a “new frontier” where people can buy up land will first require some serious advances in technology, some serious terraforming, or both. As it stands, the environments of Mars, Venus, the Moon, and the outer Solar System are all hostile to life as we know it. Even with the requisite commitment of resources and people willing to be the “first wave”, life would be very difficult for those living out there. And this situation would not change for centuries or even millennia. Like it not, transforming a planet’s ecology is very slow, laborious work. So… after considering all of the places where humanity could colonize and terraform, what it would take to make that happen, and the difficulties in doing so, we are once again left with one important question. Why should we? Assuming that our very survival is not at stake, what possible incentives are there for humanity to become an interplanetary (or interstellar) species? Perhaps there is no good reason. Much like sending astronauts to the Moon, taking to the skies, and climbing the highest mountain on Earth, colonizing other planets may be nothing more than something we feel we need to do. Why? Because we can! Such a reason has been good enough in the past, and it will likely be sufficient again in the not-too-distant future. This should is no way deter us from considering the ethical implications, the sheer cost involved, or the cost-to-benefit ratio. But in time, we might find that we have no choice but to get out there, simply because Earth is just becoming too stuffy and crowded for us! We have written many interesting articles about terraforming here at Universe Today. Here’s Could We Terraform the Moon?, Should We Terraform Mars?, How Do We Terraform Mars?, How Do We Terraform Venus?, and Student Team Wants to Terraform Mars Using Cyanobacteria.